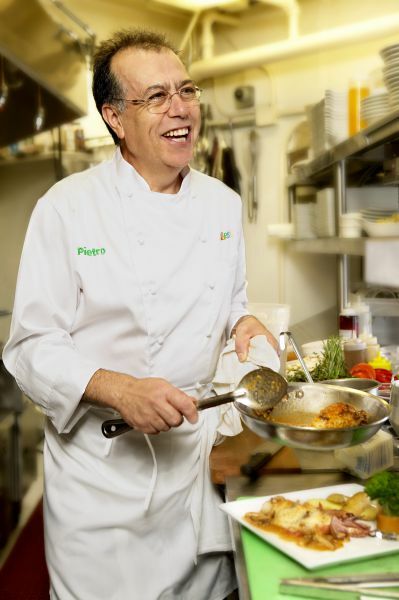 Join Chef Pietro Scotti for a very personal all inclusive dinner event at Da Pietro's Restaurant in Westport, CT on Tuesday August 21 from 7:30-9:30 pm for $85. Chef Pietro will introduce the evening with one of his specialties: Home Made Mozzarella rolled with Prosciutto di Parma and Baby Arugula over Cannellini Bean Salad. Paired with a Prosecco di Umbria, you will enjoy this starter as he returns to the kitchen to prepare an amazing menu to include Fresh Pasta stuffed with roasted eggplant, mushrooms and ricotta cheese, and a main entree of Filetto di Maile, Medallions of Pork finished with Port Wine and Shitake Mushroom Sauce. Italian wine, specially selected by a favorite winemaker, will enhance each course and the evening will finish with a dessert of Tarta di Pera, Pear Tart will Vanilla Sauce and your choice of coffee or tea. Named Best of the Gold Coast for 3 years in a row, here is your opportunity to see and taste first hand the delicious dishes at Da Pietro's!